Build-A-Bear has issued a recall of thousands of Starbrights Dragons with loose stuffing that could cause children to choke. Build-A-Bear is voluntarily recalling about 34,000 stuffed animal toys that pose a choking hazard to children. The stuffed toys are sealed with seams that may rip, giving children access to the filling. Children could potentially choke on the exposed stuffing while playing unattended. The tracking label can be found on the tag located on the back of the leg. 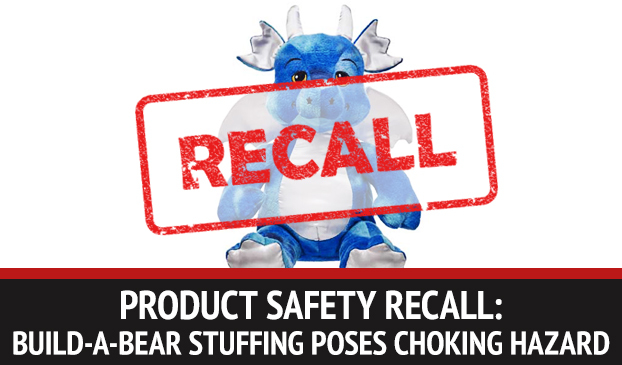 The recalled includes about 33,600 Starbrights Dragon stuffed animals manufactured in China and sold in the U.S. About 1,000 products were also sold in Canada. The satin seam on the stuffing is not secure and children could easily gain access to it. The stuffing could unfasten and pose a choking hazard. The toy is easily identifiable with blue furry fabric. The dragon has embellishments including a silver satin stomach, feet pads, wings and horns. The toy has light-up horns and plays music when the hand is squeezed. The stuffed animal is about 17 inches tall. The tracking label ending with 9333 or 9334 for America and 9337 or 9459 for Canada can be found on the label sewn on the backside of the leg. The stuffed animals could have been purchased at Build-A-Bear Workshop stores and online at www.buildabear.com between April 2015 and August 2015 for about $25. Although no injuries have been reported, the company has issued a preemptive recall. Parents should exchange the stuffed animal at a nearby Build-A-Bear Workshop store. Consumers should immediately remove the recalled stuffed animals from children’s possession and return it to a local Build-A-Bear Workshop store to receive a coupon for any Build-A-Bear stuffed animal. Call Build-A-Bear via phone at 866-236-5683 or email ProductHotline@buildabear.com. Consumers can also visit www.buildabear.com and click on Product Recall at the bottom of the page for more information.